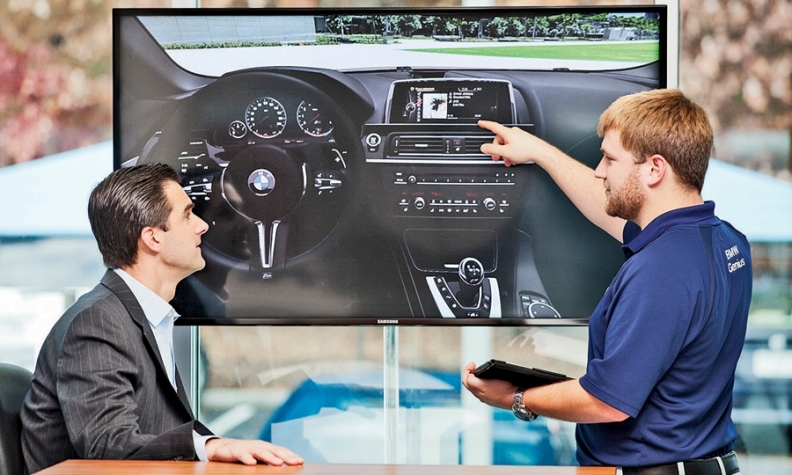 Part of the BMW sales strategy is a team of “Geniuses” who give shoppers and owners personal instruction about the high-tech features in the company's products. Cars have changed. The way people shop for cars has changed. But has the art of selling cars changed? "It needs to," declares Grant Cardone, one of the industry's best known dealership sales training consultants. "Salespeople are spending far too much time on transactions -- particularly now, at a time when it's critical for dealerships to increase their throughput." But interviews at the National Automobile Dealers Association convention show conflicting views as dealers contend with Generation Y, consumers carrying smartphones and factory pressures. The industry generally is in agreement that showroom salespeople need to be better trained -- but better trained to do what? One contingent favors better training to build customer relationships. Another proposes better training to speed things up to get customers finished and on their way. One voice says train them to hand off technical issues to other showroom employees. Another says better prepare them to be product experts. "So much right now is riding on the salesperson," reflects Joe Verde, the dean of auto retail sales training. "And that's often the least trained, least educated, least motivated person in the industry." Cardone and others say salespeople don't need relationships with consumers -- they need to get the sale done. He offers statistics to back that up. But Verde says spending less time with customers results in a lower closing rate. And he, too, has stats to back it up. In Verde's view, the notion that digital technology and Generation Y have fundamentally changed the business is exaggerated. "Nothing has really changed," he says. "People are talking about speeding up the sales process. They're talking about customers who don't want to come to the showroom. "But it's not an issue of Gen Y or older people. It doesn't matter whether it's my grandfather or my grandson shopping for a car. They expect the salesperson to be nice and know the product and to listen to them. That's always going to matter." In an era when communication devices are taking over human interaction and many dealership salespeople are armed with iPads, one dealer is bucking the trend. "I want to get my salespeople off the computer," says Adam Simms, COO of Price Simms Auto Group, which holds Ford, Toyota, Nissan, Chrysler Group and several luxury franchises in the San Francisco Bay Area. "The customer has already seen this stuff on a computer. "I'm taking laptops out of my dealership. I want to take their iPads away from them." Simms says he is trying to help salespeople focus on getting customers physically inside a car to see it, smell it and touch it. "Stop talking and get in the car," he says. Many new efforts are focused on improving efficiency, particularly cutting the time to delivery. Cardone says he is working with dealerships across the country to commit to a simplified three- to five-step sales process that results in what he calls "the 53-minute sale." "The longer the customer spends with you, the more irritated they're going to get and the lower your CSI is going to be," Cardone asserts. "Spending less time with the customer is exactly the opposite of the correct answer," Verde warns. "The statistics I've compiled say that if I spend less than 60 minutes with a customer, I'm only going to have a 6 percent closing rate. If I spend 72 minutes with a customer, my closing ratio goes up to 37 percent. And if I spend over 100 minutes with the customer, it goes up to 57 percent." A field study of 200 dealerships by auto retail consultant Mark Rikess last year found that the typical sales transaction takes four hours. And two of those are what the study deemed "wasted time." The salesperson walks away to find a manager to close on a deal, but the manager has two other customers in line waiting. The customer sits alone for 30 minutes while a salesperson tracks down the wished-for trim package, or a key fob for a test drive. "What sort of impression do you think all this makes on the customer?" asks Rikess, whose Rikess Group is working with manufacturers and dealer groups to rewire the sales process. Why do automakers care about this? Throughput is one reason. Consider the Nissan brand: Nissan wants its dealer network to garner a 10 percent U.S. market share by early 2017, up from 7.9 percent today. Doing that will require the average Nissan store to sell a lot more new vehicles than it does today. But also consider the situation at BMW. The German luxury marque posted record sales last year and expects to set another record in 2014. But last year, Mercedes-Benz pushed past BMW to become the top-selling luxury brand in the United States. And BMW was not happy about it. BMW believes it has all the new products it needs to reclaim the sales crown. But what the brand needs, BMW of North America CEO Ludwig Willisch says, is improved customer satisfaction results. "Better CSI will enable us to get to the next level," Willisch says. "And that comes from the dealership." To improve customer satisfaction, Willisch will roll out the BMW Genius Everywhere program across the franchise this year. BMW's geniuses, inspired by the Genius Bar in Apple retail stores, will be salaried, noncommission employees who explain the technical ins and outs of the car, freeing salespeople to focus on sales. But this solution also raises questions. "The traditional job of the salesman is diversifying into multiple dealership positions," observes Ted Kraybill, principal of the automotive consulting and research firm ESI Trends. "Now we often see one person greet the customer, another handle the sale, still another serve as the product specialist, another person who closes the deal and still another handle the F&I. "I'm not so sure that this is the model for the future. I believe the future will see a move to empower one salesperson to handle all that." Simms of the Price Simms Auto Group says connecting with the customer is still the key. "As an industry, we've got to do something to help make our people better and improve the process of selling," he says. "We do a two-month training academy here, and we tell our people the same thing you learned 30 years ago. You look the customer in the eye when you shake hands and you move your head up and down. "Things are moving faster and it's critically important to be transparent in the sales process now. But making that personal connection with the customer is as important as ever," he adds. "Salespeople who get to know their customers are my super salespeople. I still want that."